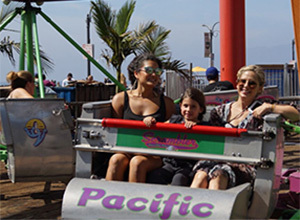 A sold-out crowd of over 2,000 guests, including many television and film celebrities, attended the 16th annual Mattel Party on the Pier at Santa Monica's Pacific Park on Sept. 27. The event raised a record amount — more than $1 million dollars — for UCLA Mattel Children's Hospital. Guests enjoyed carnival games and unlimited rides on the hot summer Sunday. They were also treated to delicious food provided by Wolfgang Puck in the LA Dodgers Foundation-themed V.I.P. tent, and gift bags filled with prizes donated by Mattel, Inc.
Actress Sarah Michelle Gellar of "Buffy the Vampire Slayer" and many other TV shows, welcomed guests and hospital patients to the event and played with the kids at mini-hoops and other games. Gellar’s long-time friend, actor Mark-Paul Gosselaar, also attended the fundraiser with his family for a second year. Dr. Sherin Devaskar, physician-in-chief at the hospital, awarded four-time Emmy-winning director David Silverman with the honorary title of "Doctor of Joy" and presented him with a special lab coat. Silverman, best known for directing numerous episodes of the animated TV series, “The Simpsons,” earned the honor in recognition of the joy he has brought to kids of all ages through his work in comedy. Said Devaskar, "The Mattel Party on the Pier is our annual, signature fundraising event and a truly special day for the children who experience our care, their families and all of the supporters who attend. For the past 15 years, the Mattel Party on the Pier has made a real difference in our ability to provide world-class health care for children." Mattel hospital patient Sam Bathfield, who is undergoing treatment for acute lymphoblastic leukemia, spoke about the importance of funds for patients like himself and other children. Since its inception, the Mattel Party on the Pier has provided unrestricted funding to launch high-priority programs and support innovative research discoveries that benefit children being treated at UCLA and around the world. Recent support has been directed to inflammatory bowel disease and gene-therapy programs, research on autism-related epilepsy and treatments to improve immune function for children who have undergone chemotherapy and bone-marrow transplants.